The last 2 weeks have been eventful for us in this adventure of weaning. River has had 5 appointments within the last 2 weeks, she’s had and gotten over a double-ear infection, started walking(somewhat! ), and while still very interested in eating continued to lose weight. Her having a really bad cold and double-ear infection did set her back, her appetite went down, which of course is normal, but timed really bad! We are now seeing the dietician once a week, and taking things one week at a time with a plan. River’s had some really big successes, but she’s gone down to 22lbs 2oz, and we don’t feel like she can lose anymore. Even though technically she’s not too underweight, she’s not showing signs of gaining and could only be expected to lose more. The plan for this week is to follow up the three big meals a day with one full syringe of formula or food. We will be supplementing her calories to try and make up a total of 800 calories a day. Hopefully she eats about half of that herself. I know we can get her gaining weight again on that amount. The trick is how to do it without losing her desire to eat, along with any other down sides of tube feeding. I have some ideas and things to think about over the next week, but we won’t move on any changes for this week, we will just take everything day by day, and next week when we see the dietitian again for a weight check and discussion we will see where we can go from there. Being celebrated this week nationally is also CHD Awareness Week and Feeding Tube Awareness Week! Please visit these sites to be further educated and inspired! We have the first signs that River wants to walk! She is able to take multiple steps on her own, once she gets a good steady stand going. She still tries to scoot most places and we really have to get her up and encourage her, but I see the end of the scooting in River’s near future! It’s been really hard to capture a good video of it. 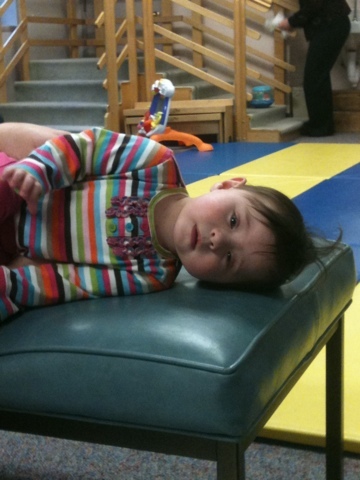 But below is a video of her at her recent PT appointment and you will see a little independent walking going on! If only my house was covered in these gymnastic matts! So we’ve entered a new phase of our lives, River and the family are slowly adjusting. I am slowly adjusting too. At first there was definitely expected upheaval and tears! River is getting to know Patty and actually things are going pretty well. Her appointments have definetly suffered in frequency, PT is about once a month, and feeding therapy will resume this week at about twice a month. Recently she had follow-ups with both Dr. Morris (Neurosurgeon) and Dr. Pickens(GI). First off kudos to Daddy who had to do both of these appointments by Himself!! 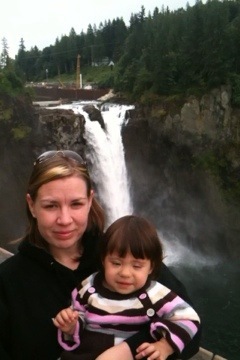 I was away for 4 days(longest I’ve ever been away from both the kids, mostly River) on a school field trip to Mt. Rainier (I’m in a geology class). River's understands now what cameras are for! Dr. Morris: River’s scar recently has “acted up”, not oozing, but swelling and looking gnarly red near the lowest part of the incision. Dr. Morris assured in his most mundane and unexcitable manner that it was stitches working their way out and that maybe we could apply a little bacitracin, but not to be overly concerned. And other than that the appointment was uneventful (from what I heard second hand). Dr. Pickens and the GI clinic: This turned out to be a very lengthy appointment for Pete and the kids, but he wanted, and so did Dr. P, to be very thorough. We really want to get River off of night feeds. We have, prior to this appointment, feeding her nearly 500 ml at night, and only getting about 600 ml down her during the day. 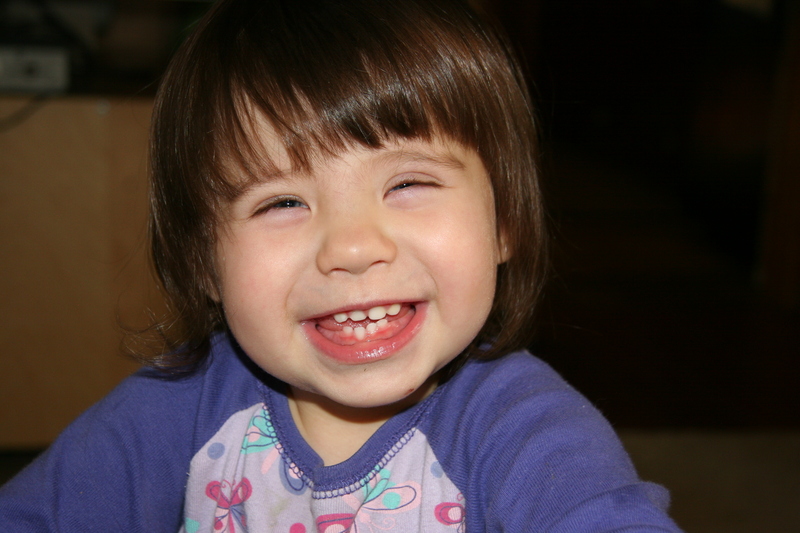 During the day it was blenderized diet(BD), and at night it was a mixture of milk and Organic Pediasmart. The highlights of the appointment were that River is growing great! She’s hovering around the 50th percentile still for weight, which is consistent and they are not concerned about calories. She weighs about 24.25lbs!! And our backs can tell. Pete and the dietician and Dr. P worked out a plan to bump up the daily feelings and Dr. P wants us to give them so her way slower than we have been, he explained that the way we were giving the syringe feeds were much too fast and were actually slowing down her digestion which would explain why it seemed she couldnt hold as much as she should logically be able too. Instead of two 70ml syringes (which we now use the Toomey syringe and it’s way better!) an hour it’ll be three 70ml (or roughly 200ml) an hour and it’ll take 45 minutes to slowly inject them. And do that 4 times a day. It seems like a huge giant change right? It is!! It is really time consuming and has been pretty difficult on all of us. The flip side of that though is that she is getting real food. To make it simpler on everyone we would stick her on a formula and a pump four times a day, in a backpack attached to her. Which is what most people do. We are torn as to what to ultimately do since this is a huge commitment. We may think of getting a new pump and backpack for her and doing a 50/50 version so as to make it a little easier. The blenderized diet is thick and heavy and doesn’t move through a pump unless really thinned down, then it’s more like a homemade formula and you aren’t getting the benefits of having thick heavy food in your stomach. The thicker it is, the more it actually stays down, and helps with vomiting. We are super reluctant to give her more thinned-down blends. But spending 3 broken up hours a day on pushing a syringe and trying to get a toddler to hold still is pretty challenging as you might imagine. The good news is that 200 ml in an hour, going super slow, seems to be working so far. There has been no increase in vomiting because of it. And now her night feeds, on a good day, are down to about 330ml. And we are hoping to keep up the trend. In 2 months we need to check in with Dr. P and if there is not enough progress he may want to give her more gastric testing (we definitely don’t want this). Physical therapy this week was a check-up with Jean, and while River’s skills have certainly improved, she is still not walking. And she was extremely uncooperative with us that morning, acting like a typical toddler and giving lots of attitude and independence. We will check in with Jean in another month. 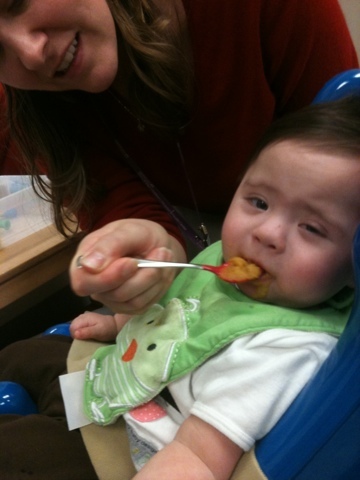 Feeding therapy this week, after a short hiatus, with Jennifer was another story. It went fantastic! River was actually interested in the food (of course I fed her less to get her hungry) she cooperated as much as a toddler can, and she discovered a sippy cup(Zo-Li) that she totally loved and drank an ounce from. We were quite encouraged. And of course Mommy went home and ordered a Zo-Li sippy cup off of Amazon. As far as River’s adjusting to the new life of College Mom, it’s turned out well! Once the initial outrage of me walking out the door or whatnot has passed, she quickly settles down with her surroundings, she’s become more comfortable with Patty, and even Patty’s car. She appears to be connecting well with her new “family members”! With our new hectic schedules and busier lifestyle, this certainly helps to alleviate my emotions! In a few days our lives are going to change a bit(understatement) when I return to school. Basically like going back to work I’ll be gone most weekday normal hours. My River will began a new phase in her life with the transition of having a nanny! I am super nervous of course! I have been a stay at home mom since losing my job when I was pregnant with Ewan! Some part of me wishes I could give as many years of SAHM to River, I feel that I’m taking something away from her, but everyone says it will be fine, even the doctor. So I’m going forth with my decision and placing our families needs and my own in front of her having me 24/7. But on to the updates! 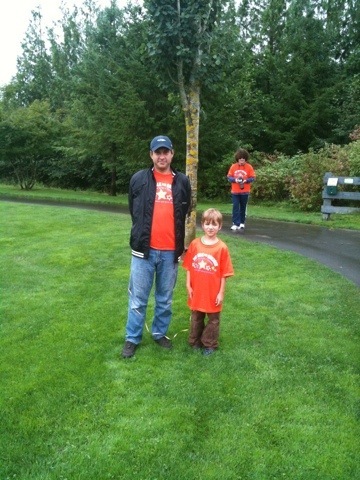 Last Sunday we attended the Puget Sound Walk for Apraxia up in Snoqualmie. 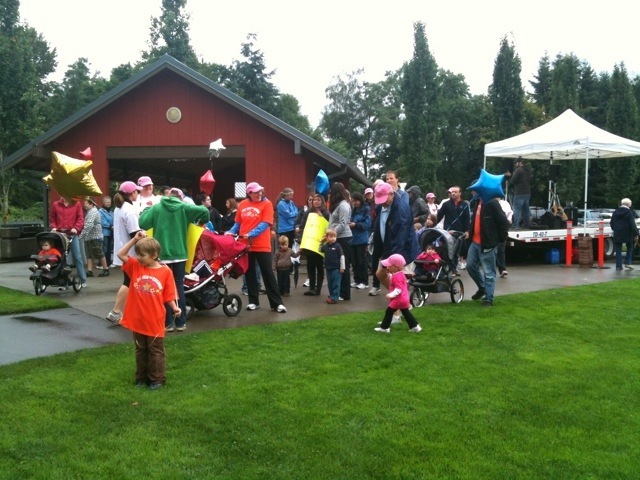 It was so great to see an event like this for kids with this condition. It was small, but they raised an amazing 8K for the cause!! We were able to meet and play with families like us. Ewan immediately took to playing with 9 year old Samuel who has a severe level of Apraxia. River has recently had many feeding therapy and physical therapy appointments, which will soon go down in frequency due to our new schedule. She definitely experienced a setback in all departments due to her back surgery. Just in the last few days she seems to be back to the level she was at before surgery. Yesterday she had her 18 month check up! It went great, although the 3 shots River got might make her disagree. She weighs a giant 23lbs 5oz! And she is 31.5 inches tall. That puts her at the 36th & 46th percentiles! She has been a little feverish since the vaccinations and I just hope that ends soon, we have our last feeding session today for 4 weeks. In about 3 weeks we will have her GI clinic visit. Ewan will begin kindergarten again following a gnarly teachers’ strike here in town, River will begin hanging out with her new buddies, I will begin my new college career and Pete, well Pete gets to do more dishes and cooking in the near furture. I’m sure my blogging will suffer some but I will continue to keep up on it when I can! Today I’d like to share with you all a little video I made of River’s physical therapy session this week. I have found a whole new way to share information and I’m very excited about it! To review again on the reasons why River is in pt are that she developed torticollus, and motor development delays. Torticollus is a quirky little condition that resulted in her infancy, she came home and we would keep her propped up for her feedings or otherwise the reflux was worse. The boppy was a handy tool, but what I didn’t realize is that she really preferred looking one way, towards the action. I rotated, but not enough. Here’s where my failure and blame comes in! She even has slight plagiocephaly. More fun stuff. This I can definitely take the blame for. Unfortunately I didn’t realize it was occurring until well into its development. Anyway, all of this and she’s in pt and we are working on her strengthening her neck so that she will hold it upright and in alignment. She does actually stay in alignment most of the time, unless she starts to get tired, then the torti neck really shows up! River’s week was a busy one considering she just had surgery! But she bounces back so quickly! And after all her laying around and venting all the time she really does seem to enjoy car rides and seeing different sites. Just like the rest of us I guess! Her week was like this: typically on Tuesdays she has physical therapy (PT), so we attended that and then also went to our once a month Mended Little Hearts meeting (we started attending in October) that evening, in the same building as therapy! Mary Bridge Children’s outpatient center is a place we spend a lot of time at. Our meeting consisted of a holiday potluck and setting up a tree to inspire CHD awareness! I put together many photo ornaments of our heart children. PT is mainly for her torticollus(“twisted neck”) she at around 3 months old tended to look to one side which created an unevenness in her muscle strength and head. She is also behind in her gross motor skills. Due to her severe prematurity and all of her health conditions. But she is coming along well and her PT is pleased with her progress and we probably wont be needing regular sessions much longer. This is her SLP Jennifer Sarver. She is very pleased most of the time with her progress. She is more willing to mouth things since the start of her teething. Her two little bottom teeth are still nubs, but it won’t be long before they are up! She does still gag and throw up occasionally, but the gagging seems to be getting more desensitized over time.